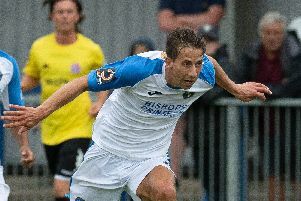 Gosport Borough new-boy Mike Carter is happy to be on his way back from injury. 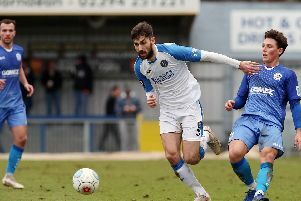 The Hawks midfielder, who moved to Privett Park on a month’s loan last week, had been out for five months with an ankle ligament injury. He had an operation in December – now Carter is taking the next step in his rehabilitation with a loan stay at Southern League Borough. That started well at the weekend, when he featured in their 3-1 win against Frome Town. Carter is determined to maximise his time at Privett Park and wants back in the Hawks team for the closing months of their National League campaign. 'It has been a frustrating season so far,’ said Carter. 'I picked up my injury early in the game against Hartlepool in September. ‘It wasn't until December, though, that I was able to have the operation. 'Afterwards I was told it would be three months before I would even be back training. 'Things have gone a lot better than I could have hoped, though. 'First of all I was in a cast and then they put me in a boot. 'Even when I was in the boot I still went to the gym every day to keep fit. Once fit Carter was always going to want to play, but he appreciated that it might be difficult after being out for so long. He said: 'After I had had a few training sessions I went and spoke to the gaffer. 'He recognised that I needed to get games and told me a few clubs had been in contact. Carter admitted he felt a little apprehensive before his first game back. With Borough in the bottom three, he was going straight into a pressure game against fellow strugglers Frome. ‘I was asked if I wanted to start, having had such a long lay off,' he added. 'My decision was to go out and give it my best go, not knowing how long I would last. 'I got 75 minutes in and it felt good. 'For me it is a big step in the right direction.